Most people have wondered “what if?” at some point in time in their lives. But what if your “what if?” happened? And what if you never knew? 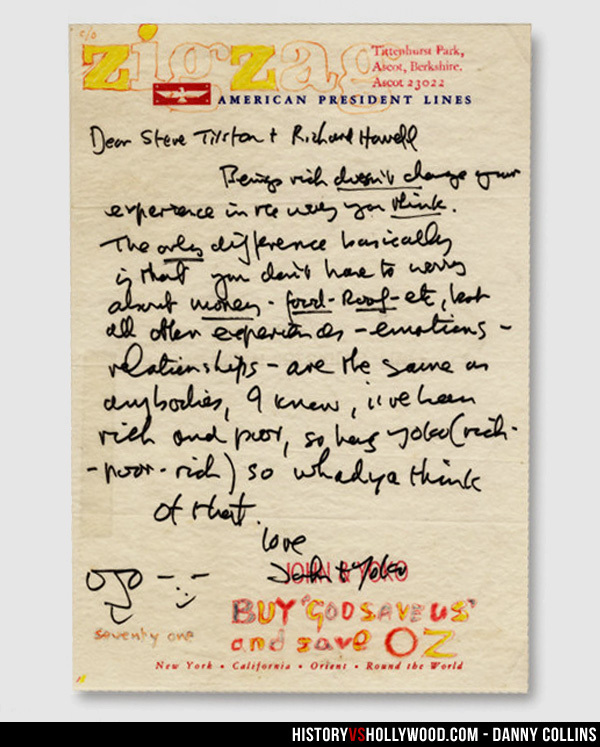 And what if your “what if?” was John Lennon writing you a handwritten letter of appreciation and advice? That’s the true story that inspired the new film, Danny Collins. In the film, Al Pacino plays Danny Collins, a tremendously successful entertainer who makes boatloads of money filling arenas and performing the hits from his 40-year career. When his manager Frank (Christopher Plummer) tracks down a 40 year old letter written to Danny from John Lennon, Danny decides to rethink his life and his choices. Lennon’s letter suggested that it is not money and fame that corrupt us, but ourselves. These words lead Collins to cancel his current tour, appropriately named The Greatest Hits Vol. 3 Tour, and move to New Jersey in the hopes of rediscovering his passion for music as well as connecting with his adult son, Tom (Bobby Cannavale) who he has never met. 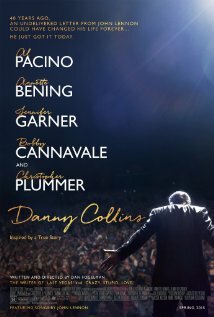 Danny Collins treads paths that ultimately feel familiar, but while formulaic, the redemption Danny seeks takes him on an enjoyable ride. Pacino is finally not chewing on scenery here. It is fair to say that the 2000s have not been kind to Pacino and watching him in films like Jack and Jill, 88 Minutes, and Two For the Money makes me yearn for the days of The Godfather…or at least Scent of a Woman. But breathe a sigh of relief, as Pacino gives a real performance here, and he is very fun to watch. In fact, his string of hollow films in recent years appropriately reflects the inner-struggle Danny Collins faces in this film. The best part of Danny Collins though is not the inner-search for creativity gone missing, but the father-son story between Danny and Tom. Both actors play off each other very well and Collins’s desire to repair the desperately broken relationship is endearing. Equally endearing are Jennifer Garner as Tom’s wife Samantha and Giselle Eisenberg as his adorable daughter, Hope. An additional romantic subplot involving Danny and Annette Bening who plays the manager of the hotel Danny stays at never really finds its footing, but the “patter” between them is fun. Danny Collins is rated R and has a running time of 1 hour and 46 minutes. Stay a few minutes through the credits for a brief clip of an interview with the real-life Danny Collins, folk singer Steve Tilston who truly did receive a handwritten letter from John Lennon 40 years after it had been written (see image, right). This is a great review and it makes me want to see the movie. Your review is much better than the preview! What is your “What if”? My what if is What if my wife went to see Monkey Kingdom with me. They probably have a lot in common.